I really LOVE these chairs and have gotten nonstop compliments. They are easy to assemble. I will say that the screws needed tightening every now and then as they get wobbly. My husband doesn’t love how low the back is, but I do! Comfortable and a conversation piece for sure! Vibrant color and smooth, supple style enhances any decor schemes with this sizzling accent chair. 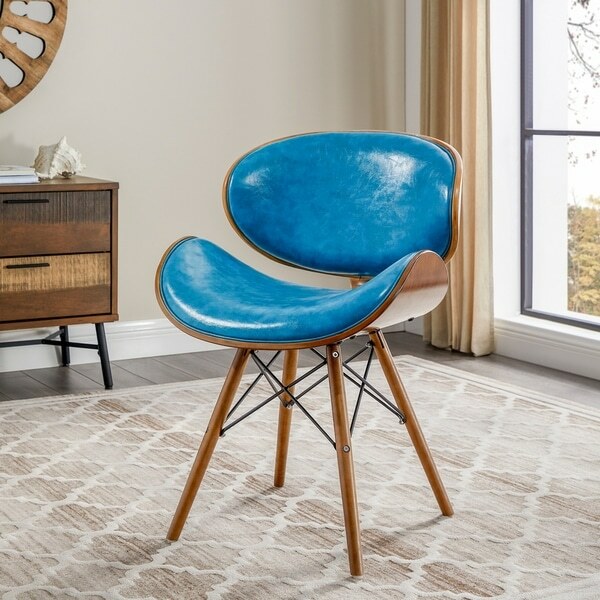 The unique design features curved seat and back pieces, finished with rich walnut on the back, and upholstered with lush, teal faux leather on the inside. A trendy Eiffel base completes the modern and elegant look of this beautiful chair. These chairs are surprisingly comfortable. At first they felt a bit awkward as the back rest stops at the lower midback and keeps you very upright. But within a few minutes the merits of this design became clear. The chair enforces good posture with all the physical and mental benefits attendant thereon. An inability to slouch kept me focused on my work: it also made me feel a whole lot less achy as the chair comfortably redistributed my weight and took a load off my spine. The teal chairs are cheerily but not gaudily bright: the midcentury design means these will go with many 20th century looks -- anything from Danish Modern to groovy 1960s. And for the price you get Ikea-level ease of assembly (took me 30 minutes total, if that, to put both chairs together), a cool look and a seriously comfortable and affordable chair. The chair is very comfortable. I'm happy that the legs are wood (lots of similar chairs are metal legs) and the wood around the seat back looks high quality. It fits in very well with my mid century theme. 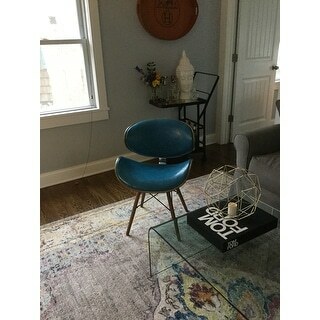 I purchased this chair for my small living room. We live in a cottage at the shore. I wanted a modern accent chair. It’s perfect for a small space and surprisingly comfortable. When we entertain we receive endless compliments. I highly recommend this piece! These chairs are beautiful and sturdy. They look absolutely fantastic with my mid century dining room table. The blue is a nice deep aqua. They are very comfortable as well. We needed an upgrade to high-back fabric chairs in our dining area. The black metal blends beautifully with wood and beautiful color of seats, and all of it works with any table linens and dishes we lay out. They are comfortable and beautiful. My husband said to be sure and tell you the hardware was top quality which facilitates easy assembly of these chairs also. Top stars for them...lots of compliments. This chair has a great color, very easy to assemble, and it is more comfortable than it appears. The wood accents are such that it will match many different decors. Gorgeous chair. Easy to assemble, an accent pieces for our living room that’s both comfortable and unique! Love my chairs. The color is fabulous. The chairs were simple to put together and very comfortable to sit in. The chair arrived and looked exactly like the picture of the chair. I am very pleased with my purchase. Perfect addition to my daughter's modern Brooklyn condo! The bright teal gives a pop of color to complement the other furnishings. Good quality. Got for an office as guest chairs. Provided a splash of color and transformed the room. Beautiful turquoise color. Seat molds to your bum. Sturdy chair. These chairs are ultra comfortable! They help you to sit up straight and maintain good posture! 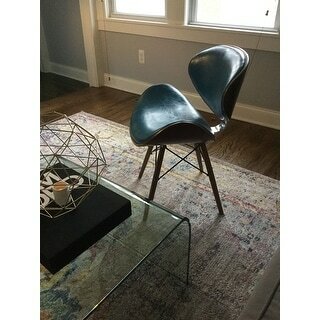 Could be used in kitchen or accent chair. Love the color , just as pictured. Easily put together! Definitely 5 star! 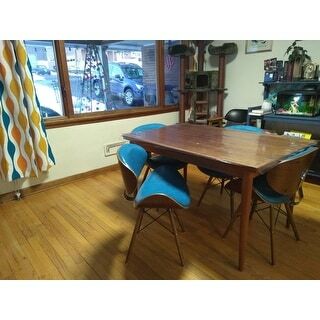 We bought these to go with our teak Danish Modern dining room table because the original chairs are very delicate and we have small grandchildren. 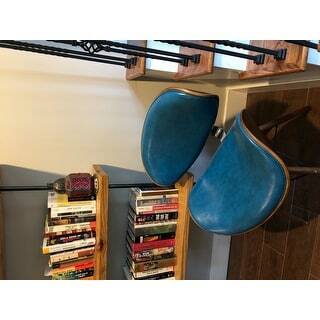 We were looking for something with the MCM/ Danish look but sturdier and reasonably inexpensive so we don't have to worry about the children damaging cthe original chairs.These chairs are terrific! So pretty, they look great with the table, are sturdier than they look, and are very comfortable. "Under the features it says that there are two chairs. Is that correct? Does one order includes two chairs?" Yes. They were about $ each. You can choose to buy 1 or 2 chairs under the "Options" drop-down box. "This chair came up when I searched for outdoor dining chairs but I don’t see anything saying it is suitable for outdoor use. Can you please clarify?" I would not use them outdoors. "The blue color looks royal in some pictures and turquoise in other pictures. Can you give me a better sense of the blue? Thanks." The leather is a very elegant turquoise not too dark and not to light. Beautiful and sturdy. Got many complements. I would call them Teal and I am an art teacher. "Can these chairs be used as dining chairs?" Yes, these chairs should work fine as dining chairs. "Are these chairs durable when you sit in them? Are they comfortable?" The chairs are durable and the weight capacity is approximately 300 pounds. "The description indicates the color is teal, but the picture looks royal blue. Is the actual color blue or teal?" I would say teal. But we have the most accurate color displayed in the images.